For those born February 10, 1950. You're one of the first people who's never lived in a world without George Orwell's Nineteen Eighty-Four. In November 2016, Andrew Simmons wrote about the experience of teaching Nineteen Eighty-Four in his high school classes after Donald Trump's election. Around the time you were born, President Harry S. Truman publicly announced his support of hydrogen bomb development. In July 1995, Thomas Powers considered the morality of Truman's decision to drop atomic bombs on Hiroshima and Nagasaki. You were born in February of 1950. This year, The Atlantic celebrates its 160th birthday, making it 2 times as old as you. The year you were born, Robert Moses, the controversial and influential city planner who shaped the development of New York City, wrote about how greedy speculators and weak regulations compromised the quality of new suburban homes. 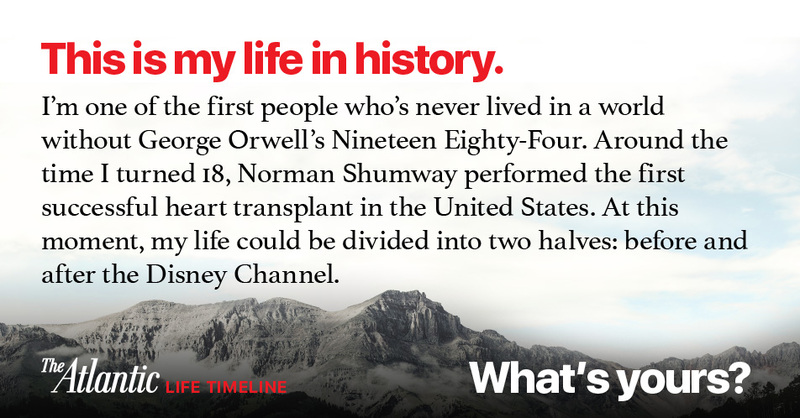 Around your 18th birthday, Norman Shumway performed the first successful heart transplant in the United States. In September 2014, Sarah Laskow wrote about scientists' attempt to create an artificial human heart. At 19 years old, you were alive to behold people walking on the moon. In 1972, Stevie Wonder, who was born the same year as you, released Talking Book, which featured two of his most popular singles: "Superstition" and "You Are the Sunshine of My Life." Shortly after its release, Wonder was a supporting act on the Rolling Stones American Tour 1972. In October 2012, Chris Williams interviewed producer Robert Margouleff about the making of Wonder's Talking Book album. Your life can be divided into two halves: before and after the Disney Channel. In July 2015, James Parker wrote about the insidious messages tweens pick up from the Disney Channel and Nickelodeon. When you turned 57, you watched humankind reach the outer solar system.